Whitey’s Lindy Hoppers were a group of black club kids who’d pioneered the highly athletic second wave of the lindy hop dance style, which would spawn the jitterbug and the jive, at Harlem’s legendary Savoy Ballroom in the 1930s. Perfecting the ‘air steps’ / ‘ariels’, which described the motion of the female dancers, who’d be thrown around by their male partners, this was as wild a style of dancing as ever devised, and it’d be another 40 years, and the advent of breakdancing, before anything came close in terms of sheer power, strength and energy. Billed here as the Harlem Congaroo dancers, and accompanied by some top-notch jazzmen (uncredited) who now I’ve learnt were Slim Gaillard (piano, guitar) and Slam Stewart (bass), who’d recorded hits as Slim & Slam, plus Rex Stewart (trumpet), Elmer Fane (clarinet), Jap Jones (trombone) and CP Jonstone (drums). The musicians set the tone by trying out the instruments brought in for a show, apparently without permission, whilst the white folk stand hidden from view in order to sneak a peep at ‘those crazy negroes’ who’ve neglected their work duties (as maids, cooks, waiters, porters etc) for a bit of revelry. This is the only time any of these performers appear in the film – their roles simply a device to enable this set-piece spectacle. As with the previous Video Blog post, which focused on the Nicholas Brothers’ famous routine in ‘Stormy Weather’ (1943), this was, once again, an example of some of the most innovative dancers of the era being restricted to playing a bit part when, had they been white and not black, they’d have surely become major stars in the entertainment world. 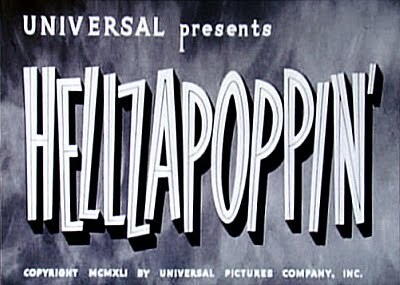 Despite the zany banality of the movie, you’ve got to be thankful to ‘Hellzapoppin’’ for at least showcasing this astounding talent, along with a handful of other films, including ‘Hot Chocolates’ (also 1941), ‘Radio City Revels’ (1938), Keep Punching’ (1937) and ‘A Day At The Races’ (1937). The world is certainly a better place for this awe-inspiring footage.